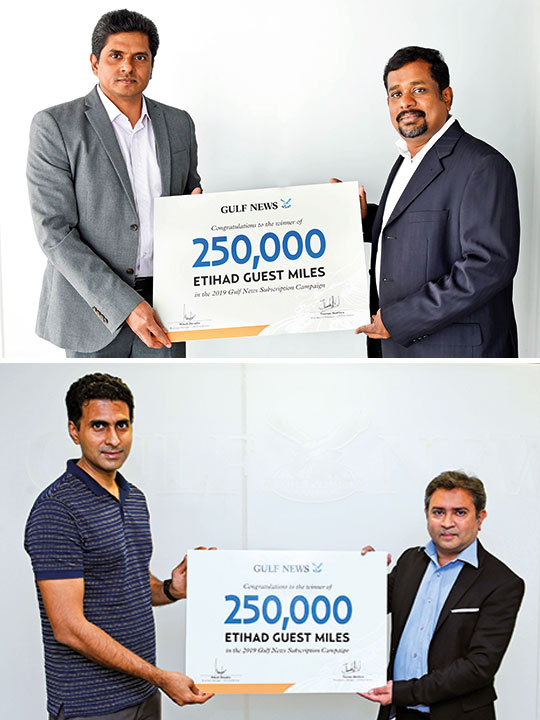 Dubai: Geevarghese Philip Malayil and Chimbu Vazhoor have been named the first winners of the 250,000 Etihad Guest Miles in the Gulf News ‘It All Adds Up’ mega subscription promotion. The final weekly draw will be made on March 24. Entrance to the draw was open to Gulf News subscribers, who were new or renewing their subscriptions. Gulf News has also given away three brand new Audi A4s to three lucky subscribers as part of this year’s subscription campaign. One lucky subscriber will get a chance to win a fully-furnished, brand-new one-bedroom apartment by Damac on the Grand Draw on April 10. Apart from the winnings, Gulf News subscribers also get savings worth Dh500 in vouchers or discounts, including two vouchers (worth Dh50 each) for Nando’s; Dh200 voucher for VLCC; Dh100 off on selected products of Omron; and Dh100 off on Zomato Gold Membership.